?Grand Duke Kyril? L. Leroy & Cie, Paris, 1922, especially made for Grand Duke Kyril of Russia. Very fine and rare, extra large, silver and 18K pink gold gentleman's wristwatch with single button chronograph on the crown. C. three-body, solid, polished, two crowns, pink gold bezel, case back edge and winding crowns, solid silver case, silver mobile geometrical lugs. 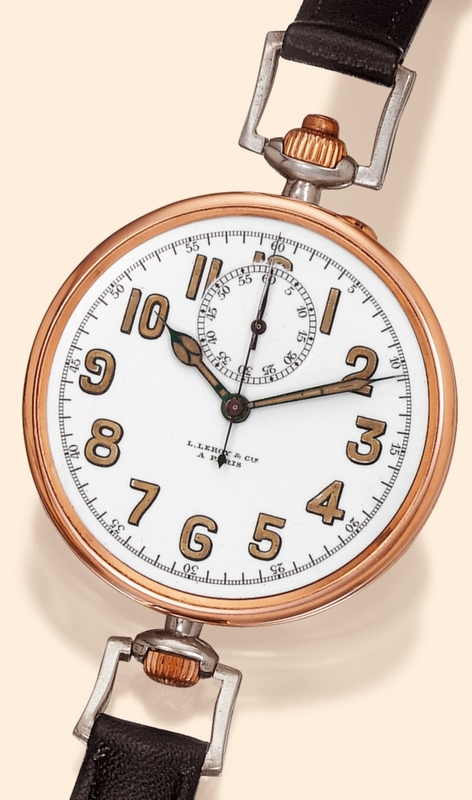 This watch was bought in a sale of Property from the Estate of the Heirs of Grand Duke Kyril of Russia, first cousin of Czar Nicholas II and heir to the Romanov throne until his death in 1938. Grand Duke Kyril of Russia Born at Tsarskoe Selo on October 12, 1876, he was the first cousin of Czar Nicholas II. His mother was Maria Pavlovna, Duchess of Mecklembourg-Schwerin (1854-1920). and his father was Vladimir, Grand Duke of Russia (1847-1909), brother of Nicholas? father Czar Alexander III (1854-1894). In 1905 Kyril married Victoria Feodorovna, formerly Victoria Melita of Saxe-Coburg-Gotha. Nicolas II abdicated in 1917 in favor of his brother Mikhail, who abdicated in his turn and was later killed by the Bolsheviks. Thus, Kyril became head of the Imperial House of Russia. In 1922 he assumed the responsability of Curator of the Throne. In 1924, finally convinced of the death of the Czar and his family, he proclaimed himself Czar and autocrat of all the Russias. Grand Duke Kyril died in exile in Neuilly sur Seine, on October 13, 1938, and in 1995 he and his wife, the Grand Duchess, were buried with military honors in the Crypt of the Cathedral of SS Peter and Paul in St. Petersburg.